These bars taste like caramel apples, but without all the fuss! In a large bowl, cream together the brown sugar, butter and shortening until smooth. Combine 1 3/4 cups flour, oats, baking soda and salt; stir into the creamed mixture until well blended. Set aside 2 cups of this mixture. Press the remaining mixture into the bottom of an ungreased 9×13 inch baking pan. In a medium bowl, toss apples with lemon juice, then toss them with the 3 tablespoons of flour. 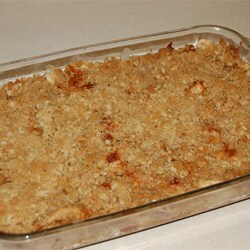 Spread the apple mixture evenly over the prepared crust. In a small saucepan over medium heat, melt caramels, stirring frequently until smooth. Pour the melted caramels evenly over the apples. Sprinkle the reserved oat mixture over the top of the apple layer. Press down lightly. Bake for 25 to 30 minutes in the preheated oven, until the top is golden brown and the apples are tender. Cut while slightly warm and refrigerate any leftover bars.